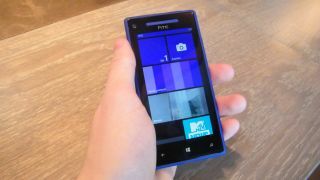 The Windows Phone 8 release date is inching ever closer as O2 adds the HTC Windows Phone 8X and Windows Phone 8S to its 'coming soon' page. There's still no concrete date etched indelibly in our diaries, but Windows Phone 8 handsets are set to land at some point in November 2012. The arrival of the two flagship Windows Phone 8 handsets on O2's site doesn't herald much other than a reminder that they're on their way. It comes as the rumour mill churns out a potential competitor in the form of a possible Microsft-branded Surface smartphone running Windows Phone 8. But if the rumours prove to be true, Microsoft will be hard pressed to out-do the HTC Windows Phone 8X which sports a 4.3-inch 720p HD Super LCD 2 display, a 1.5GHz dual-core processor and 1GB of RAM. If Microsoft does have a handset in the works, we'll be surprised to see it launch in time to do festive battle with HTC's new phones anyway; stay tuned for a more accurate Windows Phone 8X UK release date as well as pricing details and a full TechRadar review.